Willie and Emily Emma Paskett Shaw already had four girls when Elaine came to join their family, making it five girls. She was born October 22, 1906 at Grouse Creek, Box Elder, Utah. Their home was located on the west side of the block (the house was located where Hughie and Marge live at this time). When she was two, her parents had another baby, a son, whom they named William Philip. I think because of the age difference between her and her older sisters that Bill and Elaine were playmates. When she was seventeen, William Frost started paying attention to her. For their wedding, they traveled all the way to Sacramento, California, and that was very unusual. 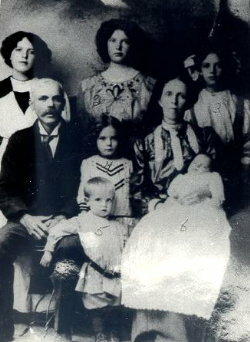 William and Elaine had eight children, seven of which grew to adulthood: Wilda, Max, Reed, Darlene, Stanley, Ada and Kent. Their seventh child, Myrtle, died nine days after her fifth birthday, a birthday at the hospital. Top Row: Mary E., Ada, Viola E.
3rd row. Bill and baby Elizabeth in Emily Emma’s arms. Their home was a log cabin located just north of the dugway and south of the home Raida Kimber lives in. It had three rooms and an attached cellar. The back room was not considered livable. It was where the water from the pipeline entered the house. 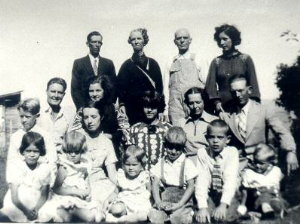 In 1944, this family moved to Tremonton. They left behind one daughter, Wilda, who had by this time, married Ray Kimber. After living in Tremonton for some time, Elaine moved to Boise, Idaho. Before that time, the children would visit Wilda in Grouse Creek every chance they got. You can take the children out of Grouse Creek but you can’t take Grouse Creek out of the children. Elaine died on November 21, 1960, at the St. Alphonsus Hospital in Boise, Idaho, of liver problems and was buried at Grouse Creek beside William, who had died three years earlier.